Fixing a gate can be easy, but how do you make sure the repair will last? When you have to repair a gate, the urgency of the task sometimes takes precedence over the quality of the repair. After all, the fastest way to fix a wrought iron or wooden gate is often to call the first repair company you come across. But taking the time to choose the right repair service is crucial. Learn what makes Garage Door Repair Naperville the right choice for you. Even high-quality openers can malfunction, especially when exposed to the weather day in day out. This is a problem that affects certain gate systems more than others. However, a gate opener repair can be an easy and relatively inexpensive task for a specialized company. We can repair and replace any type of commercial or residential gate opener, carry high-quality replacement parts, and in most cases can perform any replacement on the same day you call. Our job doesn’t end with the repair. After we fix the broken part or replace it, our experts will test the alignment and perform other usability tests. Whether we are talking about wrought iron gates or driveway security gates, these tests are meant to ensure your gate works perfectly. 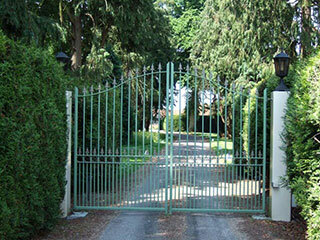 The result is not only a fully functional gate but also a lot less stress. Give us a call and save time and money! With us, you pay only for the real work done and any replacement parts needed. Whether we repair a motorized gate, change the intercom system, or perform an opener or hinge welding repair, we provide transparent quotes from the beginning. Finding out that you have to pay more than you have expected is unpleasant. We make sure that never happens. Should parts of your gate require replacement, we communicate that up front. As a professional gate repair company, we provide the best value services for your money, just as we do for your garage door! Have Your Gate Professionally Installed or Repaired! Our gate repair experts are ready to listen to your problem and answer any questions you may have. Contact us now!